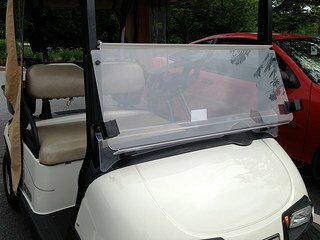 A golf cart windshield serves to keep you dry and warm on cold, rainy and windy days. Acrylic windshields are breakable while polycarbonate windshields are less likely to break. It may be that you need to replace an existing windshield or are looking to add one to your golf cart. 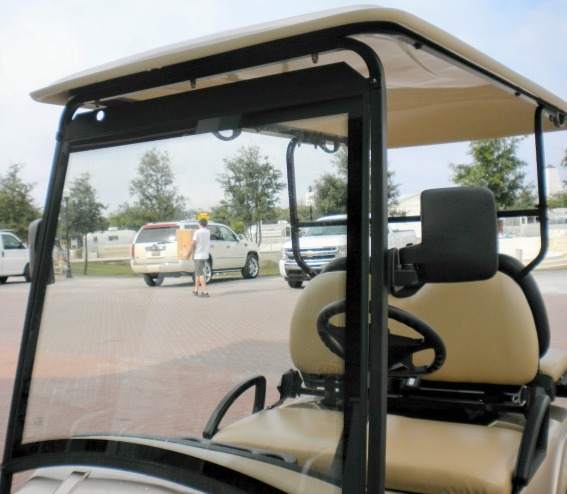 This golf cart accessory is specific to your golf cart make, model and year. Acrylic is the most common material used for windshields. It is the least expensive and the hardest, meaning it is less apt to scratch but also more apt to break especially if hit by a golf ball. I have tinted and it does help to reduce glare. I think it looks a little classier. A tinted version typically costs about $25 more than the clear one. The material most often used is a modified acrylic. Rubber is added to the acrylic windshield making it more shatter and crack resistant. However, since it is softer than acrylic it scratches more easily. A fold down option is great on hot or warm days and helps to keep you and your riders cool and comfortable. 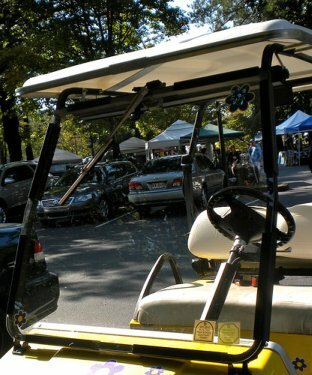 A single or solid windshield is required for DOT approved street legal golf carts made of AS-1 or AS-5 composition. Windshield wipers are required as well. The side wings deflect wind from the passengers. 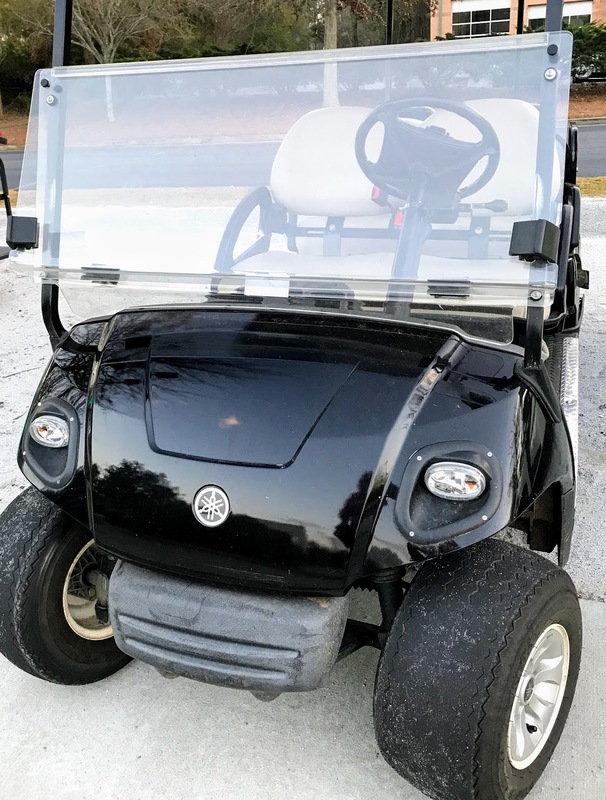 At sometime you may need to replace your golf cart windshield due to lots of scratches, broken hinge, or a cracked windshield. You will need to know the year of your Club Car before you purchase your Club Car windshield. There is a standard model for the years 1982-2000.5 (in 2000 Club Car made some changes mid-year so they have a split year). 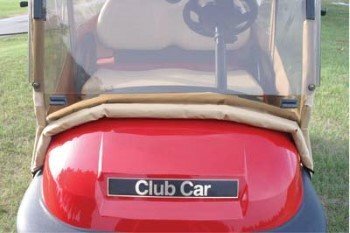 The Club Car windshield is available as a hinged, fold down windshield. I really like the hinged windshield. I can't imagine why anyone would want a one piece. I keep the windshield down on warm days for the cool breeze and up on cold, windy or rainy days. You can purchase them as clear or tinted. I have had both and do like the reduced glare with the tinted windshield. It's a very subtle tint that doesn't make everything look darker. 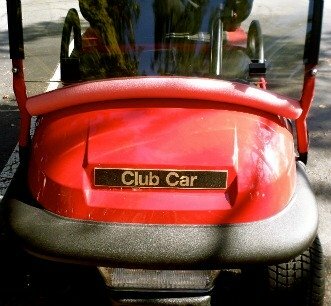 My newly refurbished Club Car golf cart has a tinted windshield. I just like how it looks and I'm glad that I chose it this time even though it costs more than the clear golf cart windshield. 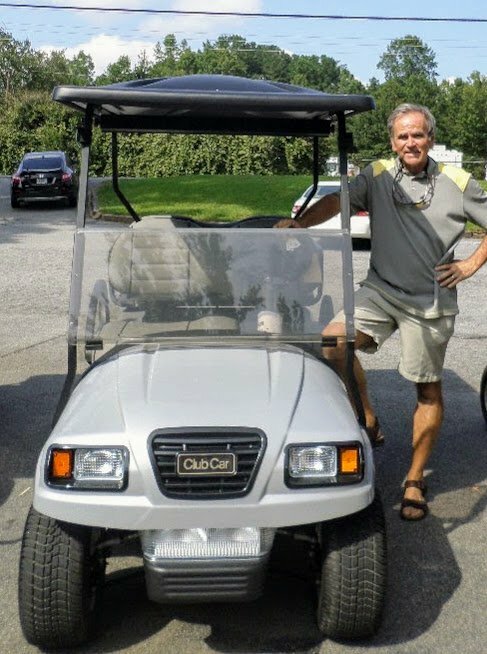 Most windshields cost around $100 - the more expensive ones over $200 are for street legal golf carts and are made with a tougher high-grade polycarbonate. There are lots of reasons why you may need to replace your EZ Go golf cart windshield. It may have developed a crack, the hinge has deteriorated, or the acrylic has become foggy or hazy. It is an easy DIY golf cart body party to replace. Just be sure you are getting the right one for your model and year EZ Go golf cart. 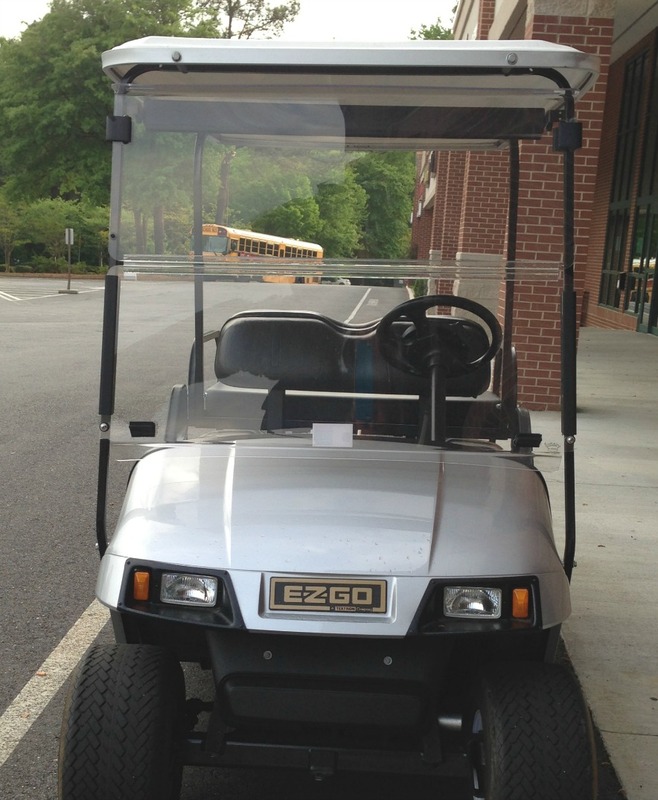 In order to purchase the correct EZGO windshield, you will need to know the year of your golf cart. This windshield comes in the fold-down or split style - which is in my opinion, the only kind to get. You will need to know the year of your cart. If you think it's a big project to change out your windshield, think again. It can be done in 10" and boom you have a nice new clear windshield that doesn't rattle anymore. Older golf cart windshields don't conform to the front cowl which means there is a large gap for the wind and cold weather to blow in. Lots of people fill the gap with a foam noodle. But I say keep the noodle in the swimming pool and off the golf cart. You can purchase a wind seal that fits the Club Car Precedent and Ezgo TXT/MED golf carts. They go for around $32. It fills in the gap and prevents air from flowing into the seating area. Or you can upgrade your existing windshield and replace it with an easy to install windshield that conforms to the front cowl for a custom look. How do you prevent your golf cart windshield from becoming dull or hazy? 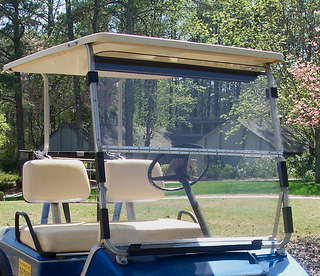 Golf cart windshields are made of acrylic or polycarbonate material. I'll just state the obvious - they are not made out of glass. Which means you can't clean them like you would glass windows or glass windshields. The number one piece of advice for cleaning your golf car windshield is do not use ammonia based products - like Windex. Cleaning solutions with ammonia (like Windex) will eventually cause the plastic to become dull or hazy. You can use warm water and mild soap detergent with a soft cloth. Wipe the windshield down gently. If there is alot of dirt on the plastic, applying pressure can cause the plastic to scratch. This goes for drying the windshield as well - if there is any piece of sand or dirt left, applying pressure on the plastic can again scratch it. Just dab it dry. Do not use other spray solutions and if you're out in the woods and getting pestered by bugs, be sure you don't get any Off insect spray on the windshield - it will ruin it. See how hazy and foggy this golf cart windshield is? It cannot be restored to it's original clarity - it needs to be replaced or you can try a scratch remover. However, if you find that there are scratches on your windshield, it is possible to remove some of the lighter scratches with a windshield polish and cleaner. This polish works by filling in tiny scratches with an optical-grade silicone that actually improves clarity and reduces glare and fog. 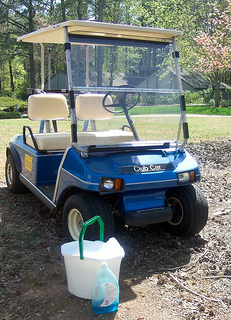 Most golf cart shops or on-line businesses sell a windshield protectant and polish. The best time to start using this product is when your windshield is new : ). The polish also protects your plexiglass by repelling water, dirt, sand and salt. I've been able to delay buying a new Club Car windshield, by purchasing new windshield clips that hold the windshield in the upright position. After years of use and exposure to the sun and rain, the clips can become brittle and lose their tightness which leads to lots of rattling. These clips are inexpensive and easy to replace. 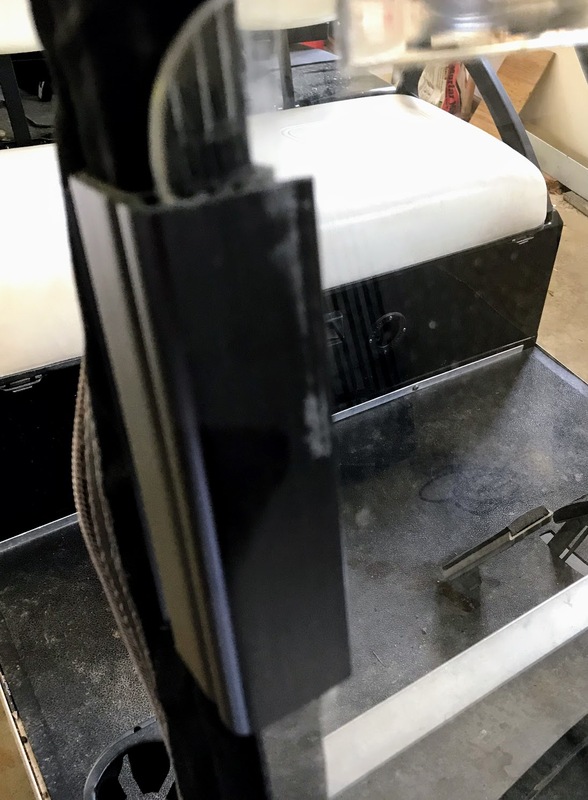 Golf cart windshield clips that hold your windshield in the up position need to be replaced periodically. You will find when your split windshield starts banging around and the clips become loose because of wear and tear, it is time to replace them. These rubber snap-on clips cost just a few dollars. Compare that to a new golf cart windshield which is usually over $100, and you've saved a lot of money. This is an easy thing to replace. 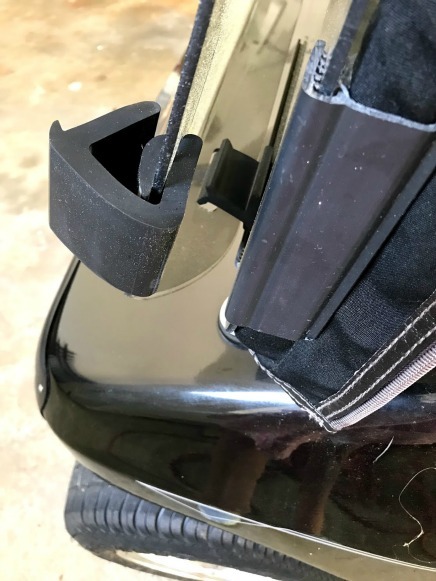 To buy the correct windshield clips for your golf cart you will need to know the size of the frame or the strut that holds the windshield. The most common sizes are 3/4" or 1". It is not specific to a golf cart make or model. They come as a set of 2 and usually cost under $20. You can snap these clips into place by using a rubber hammer - no gluing or screwing in a part is necessary. The golf car windshield hinge eventually wears out as well. This has happened to us several times. This last time, I was afraid to fold down the windshield, because the hinge had become loose and decayed, and if I hit a big bump, I thought it might just come apart. The rest of the windshield was fine and I didn't want to spend the money to get a new one. So I went to several of our local Club Car dealers, but none of them sold the hinge - only the whole windshield. Not to be easily discouraged, I went to our local hardware store and bought a long metal hinge and screwed it on over the broken hinge. It's been on for over three years and has worked great.